Another Cat Meme Going Viral? For my unique meme I decided to use a mix of #catcontent and #collegelife. I also wanted to make sure to use one of my own pictures, otherwise I would have felt like it wasn’t really my personal meme. 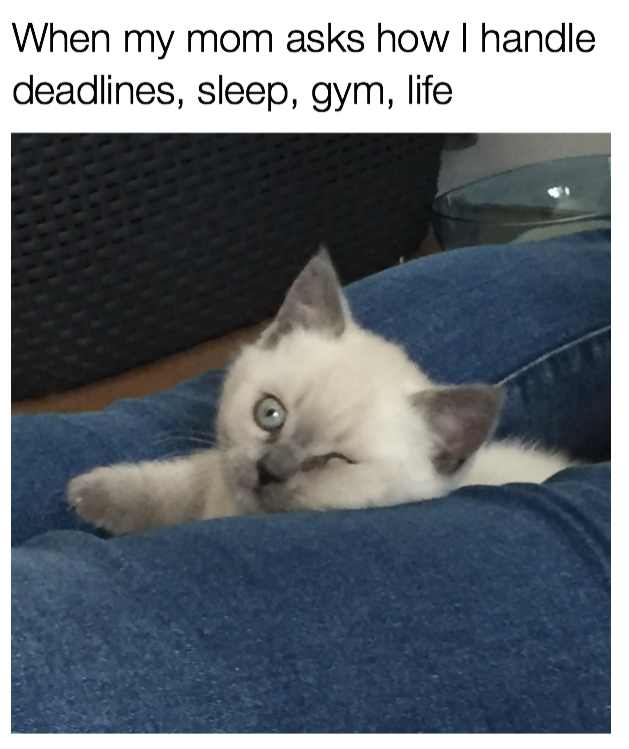 Therefore I chose a funny picture of my cat Elsa when she was still a kitten and paired it with a college related caption. I personally prefer the memes with the white background over the ones that have the caption right on the picture, that’s the reason I went with the following layout. I stated my business plan objectives in the following kind of way: I listed the platform and what I wanted to accomplish in which kind of measurable. I concentrated on the platforms Imgur, Twitter, Instagram and Facebook. I measured the engagement around my meme in new followers, shares and retweets and likes. Unfortunately I was only able to accomplish two of my six goals. Both of these however exceeded my expectations. Here are the different platforms and my goals I had set for the engagement on them in my business plan. Imgur is the platform the meme was uploaded to in the first place. This platform hosts a ton of different memes and images and allows you to share it to other websites and social media from there. It also tracks the total views of your image/ meme. This is the place all the engagement essentially comes together, as it shows the total views of the meme. My goal was to reach 500 views on Imgur. Within two weeks of being on the platform my meme reached a total of 253 views. Twitter is the platform we chose to start an paid campaign on. We all spent $5 on Twitter Ads to get more engagement. The one and only post I chose to promote was my initial post. I thought it was strategically better to only promote one post and get the most possible engagement on that one. My engagement rate was at least double as the ones I usually see on my tweets. In addition to the promotion on Twitter I personally chose to also post my meme on my Instagram and Facebook. I didn’t want to interfere with my brand on my main Instagram handle, so I posted the picture to my second Instagram. However I still wanted to use my huge count of followers to engage with the meme, so I promoted my second Instagram in my stories, to draw my follower’s attention towards the meme on my second channel. This technique was very successful and within the 24 hours the story to promote my meme was public, my meme reached triple the amount of likes that I stated in my business plan. I planned on reaching 10 likes, as I don’t have many followers on my side channel, but eventually got a total of 30 likes, as I was able to to draw the audience from my main channel. I also chose to post it on Facebook, as it was very likely to me that my friends will engage with the meme. Most of my Facebook friends are the same age as me, so the perfect target audience for my meme. My goal was to reach 15 likes on my Facebook post. Unfortunately I didn’t reach that goal. Why did my meme fail? Over all my campaign didn’t succeed the way I had expected it to – especially regarding the campaign promotion with Twitter Ads. However in my opinion what makes am meme go viral is not only the promotion and distribution behind it. I have experienced that there is a lot of luck behind content going viral. In addition to an elaborated marketing plan, a meme has to be in the right place at the right time to perform extraordinary. I also found it hard to use Twitter as starting platform, as I don’t think that’s the right place for memes. I also thought it was hard to get people to click on the Imgur link, because they want to see the actual meme on social media and won’t follow a link to something they don’t know.